Newly released texts involving Mayor Jenny Durkan and City Councilmember M. Lorena González underscore how polling results helped spike the city’s head tax and offer an unvarnished look at the motivations and strategies behind the abrupt about-face. Newly released text conversations between Mayor Jenny Durkan and a union boss and a multimillionaire entrepreneur underscore how dire polling results helped drive Seattle officials to abruptly flip-flop on the city’s controversial “head tax” for housing and homeless services. The mayor’s separate exchanges with David Rolf, president of the Seattle-based Service Employees International Union Local 775, and venture capitalist Nick Hanauer also illustrate the access each had to Durkan to discuss the troubled tax on large businesses in the days before the public learned about City Hall’s plan to spike it. “Pulling the head tax down now is super super smart and strategic,” Hanauer texted Durkan on Sunday, June 10 — the day before Durkan and seven City Council members issued a joint public statement announcing they intended to reverse course. “Thanks — totally agree,” Durkan responded. Both Hanauer and Rolf — who texted Durkan about the polling results — separately declined to comment through their spokespeople. Civic power brokers who worked together years ago to push for Seattle’s $15 minimum wage, each had publicly supported the head tax before the polling. Released last week, the text exchanges are the only behind-the-scenes conversations about the repeal by the mayor so far disclosed to The Seattle Times in response to a state Public Records Act request. In May, Durkan had held dozens of meetings with a wide range of interested parties and received nearly 5,000 emails from constituents, her office said. 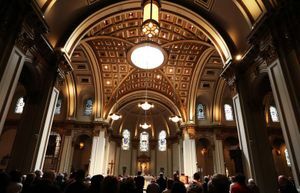 Communications by City Hall officials are at the heart of two lawsuits accusing the council of violating Washington’s Open Public Meetings Act by deliberating and deciding to repeal the head tax in private. Durkan’s texts, along with texts between Councilmember M. Lorena González and an aide that recently were turned over as part of one of the lawsuits, offer an unfiltered look at motivations and strategies behind the city’s surprise about-face. They also speak to just how politically problematic officials believed the situation had become. “We need to get rid of this albatross and then quietly work to figure out what takes its place,” González texted Saturday, June 9, after Rolf and political consultants had, in a conference call, briefed her, three other council members and two Durkan deputies on the polling, which showed significant voter opposition to the head tax and dismal job ratings for the council. “TM kept talking about needing an alternative measure,” replied Cody Reiter, González’s legislative aide, referring to Councilmember Teresa Mosqueda. In the months before the head tax passed, González and some other council members had championed the measure, while the mayor had mostly stayed on the sidelines. 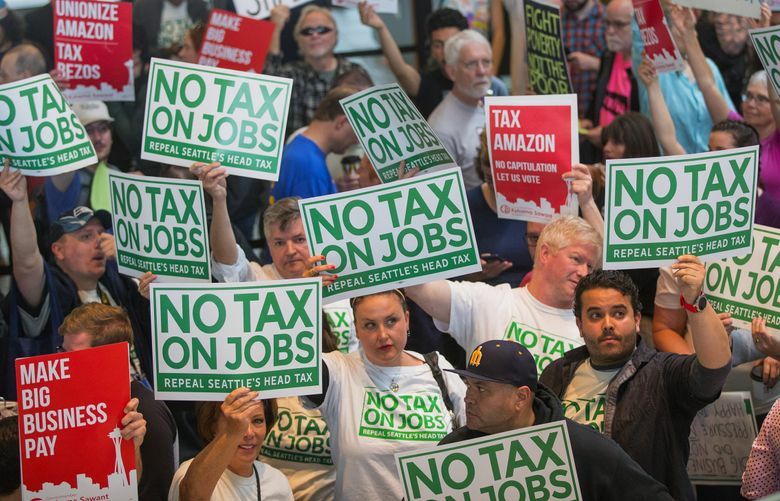 Durkan stepped into the spotlight in May after Amazon threatened to stop adding jobs in Seattle because of the head tax, and she worked to reduce the size of the tax as a compromise. But soon after that version of the tax passed, Amazon and other businesses joined City Hall skeptics in a campaign to repeal the tax through a popular referendum. By early June, the opponents were saying they had collected enough petition signatures to put the issue on the November ballot. After the June 9 conference call to discuss the grim polling results, González and Reiter exchanged texts about blame for the head-tax imbroglio. González, through a council spokeswoman, declined to comment. “These texts are involved in pending litigation and our attorneys have advised us not to comment,” spokeswoman Dana Robinson Slote said in an email. Neither the city, the political campaign that commissioned the head-tax polling, or the unions bankrolling the campaign have publicly released the results. But according to a half-dozen people briefed on them, the results showed a majority of voters opposed to the tax and unlikely to budge. The council’s sudden announcement on Monday, June 11, calling for a special meeting to vote on a repeal, along with a joint statement by Durkan and seven council members signaling support for the move, quickly drew concerns among open government advocates. The next day, the council voted 7-2 to cancel the $275- per-employee, per-year tax that would have been imposed on nearly 600 high-grossing businesses to raise an estimated $47 million per year. The measure had won unanimous approval in May. After the council voted and Durkan signed the repeal, attorney James Egan and government transparency activist Arthur West separately sued, contending the council had broken the public-meetings law. City Attorney Pete Holmes repeatedly has said the council didn’t break the law. Last month, in answers to legal questions in Egan’s case, Holmes’ office said Durkan’s deputy mayors, Mike Fong and Shefali Ranganathan, had joined the council members on the June 9 conference call to discuss “polling results about the public reaction” to the head tax. “Although a potential repeal of the (head tax) was raised by non-city employees participating in the call, there was no proposed repeal at this time,” Holmes’ office said. The texts exchanged between Rolf and Durkan, who was traveling in Boston on the day of the conference call, show the union leader was at the center of the polling discussions. The SEIU Local 775 boss was referring to Fong and Ranganathan and to political consultants Kelly Evans and Sandeep Kaushik, said Stephanie Formas, a spokeswoman for the mayor who declined to comment further on the texts. Evans and Kaushik worked on Durkan’s mayoral campaign last year. In an email, Kaushik said they were “offering thoughts and advice to several people involved in the head-tax discussion,” including Rolf. In his June 9 texts to González, Reiter indicated he was present for a “post call debrief,” noting that Rolf and the deputy mayors were the “only other ones” at EMC Research — the political-consulting firm that conducted the head-tax polling. “they are going to communicate these results to the other 4 CMs and the Mayor (possibly with a redo of this briefing),” Reiter texted his council member. Such texts, combined with the city’s answers in the Egan lawsuit and interviews, indicate a majority of council members didn’t privately meet at any one time to discuss a repeal. 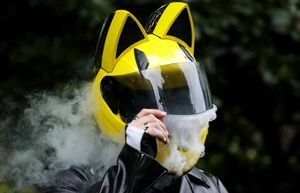 But eight of nine council members, through a series of phone and text conversations, and sometimes aided by third parties, received information about where other members stood on a repeal. Just because a quorum, or majority, didn’t privately meet before the repeal vote doesn’t mean the council didn’t violate the OPMA. According to training materials previously provided to at least some council members, discussions through a daisy chain of emails, texts, phone calls or small groups that create a “walking majority” may constitute a meeting subject to the law.